Discover riches and glory all at the same time in a unique and iconic adventure that would simply take you on a mental trip back in time. 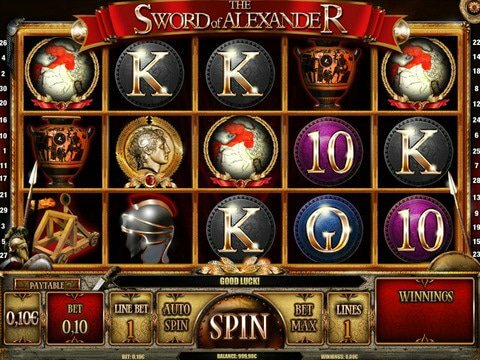 The Sword of Alexander Slot Machine developed by the one and only iSoftbet Software , is one of the most appealing historical games out there that will take you to meet the iconic character of the empire, Alexander the Great. Do your best in this game and find yourself swimming in luxury at the end of the Great War. If real-money playing is not an option for you right now, you can still enjoy the experience by giving it a review in The Sword of Alexander Free Play Slot demo that can be found on this page. Play right away and discover yourself how this game would take you to a thrilling ride through history. This game comes with a 5-reel and 30-payline setup that dominates the screen of the game. The background of the game is a simple yet very appealing black screen, providing an ingenious contrast with the symbols which creates a cold and incredibly stylish vibe befitting of the Great War at Alexander's time. The game is pretty intuitive as well, but you'll surely crave more for audio in this game to complete its revering nature. There's a hefty amount of symbols in this game as well that will surely prove themselves to be quite lucrative. There are common high card symbols in this game, designed to complement the theme of the game. The cards are the low-paying symbols, and the others that are related to the game from the helmet, shield, mysterious woman and more, are the high-paying symbols. The game also has simple special symbols that's embodied by its wild that could help you aim for winning combinations by substituting for other symbols and the scatter soldier symbol that could grant you free spins. Despite its simplicity, there's no doubt that the game may just be your path to fortune, making it a must-play for anyone. There's quite a bit of games out there that plays with the theme of Empires and Iconic Characters in history. Other than The Sword of Alexander Slot Machine, there's also the Caesars Empire Slot Machine that you have to try. It brims with the aura and vibe released by Empires of the Past, especially with its background that hosts the grand and ancient-looking coliseum. This game is developed by RTG as it possesses a 5-reel and 20-payline matrix to help you win it big. The graphics of the game is a bit more cartoonish compared to the Alexander game, but it definitely packs a huge blow in terms of prizes and rewards. Enjoy The Sword of Alexander Slot Machine and optimize your winning conditions by making sure that you play it not just anywhere. You should have fun with it by playing it at one of the best casinos of iSoftbet Software. We recommend players to have fun at Slots Million Casino . It possesses superb security, 100 free spins bonus scattered for 5 days, a 100% initial deposit match-up promotion up to $100 and a whole lot more. Maximize your winning potential and enjoy slot gaming like you've never had before.